The Deputy President of the Senate, Senator Ike Ekweremadu, has called on Nigerians to show love to their neighbours at Christmas, as that remains the fundamental message of the yuletide. 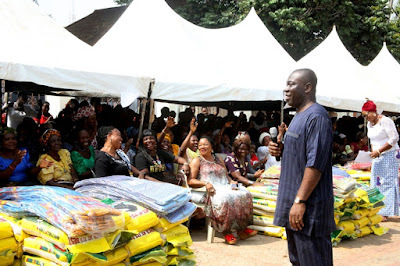 He stated this in Enugu in his Christmas message at the weekend when his wife, Lady Nwanneka Ekweremadu, made Christmas presents of N10,000, a bag of rice, and a wrapper to each of 250 widows, drawn from the five Local Government Areas of Enugu West Senatorial District. The Senator, who said Christmas would be empty without acts of love as shown by Christ, also observed that love was also engrained in African cultures. He stressed that “the spirit of sharing is an African tradition that generates happiness and ensures social stability in the absence of a formal social security mechanism that caters for the less privileged in our society”. He added: “I grew up in a system that had an inbuilt social security mechanism, where we were our brother’s keeper and cared for one another. If you didn’t have a tuber of yam, you shared from your neighbour’s; and you could go to your neighbour’s house to get fire and light your house; and when somebody got admission to study at the university, people contributed money to ensure the person got education. One person’s problem was everybody’s problem in those days. And that is exactly the tradition we are trying to keep alive”. He, however, regretted that the nation had lost much of her traditional social security values and urged that they be reflected on and revived at Christmas. “Some of those attributes of our community began to dwindle as society advanced, but we have to keep them alive, especially when government has not come up with a defined social security programme to ensure that everybody counts, and that everybody enjoys the good things of life; this way, we can generate happiness and help secure our system,” he said. Earlier in her remarks, wife of the Deputy President of Senate, Lady Nwanneka Ekweremadu, said the act of celebrating Christmas with widows had become the family’s tradition since 1997 as a way of giving back to the society and help ameliorate the widows’ losses and hardship. She said: “Christ ministered to not only the spiritual needs of the people while on earth, but also to their physical needs. He fed the multitude. government areas and each year we try to take different people so that whatever we are giving will go round. scholarships to the indigent students and then at a point we extended it to Igboeze North and Enugu North. adult literacy whereby we give education to thousands who had no opportunity to have formal education through adult literacy centers, which we set up in all the five Local Government Areas. “By God’s grace, we hope to keep faith with the tradition, as part of our own way of giving back to the community that made us". Meanwhile, Senator Ekweremadu also wished the Christian faithful and the nation a merry Christmas.